Sustainability Initiatives Coordinator Dan Hendry welcomes Bayridge Secondary School students to a Kingston Transit orientation session. 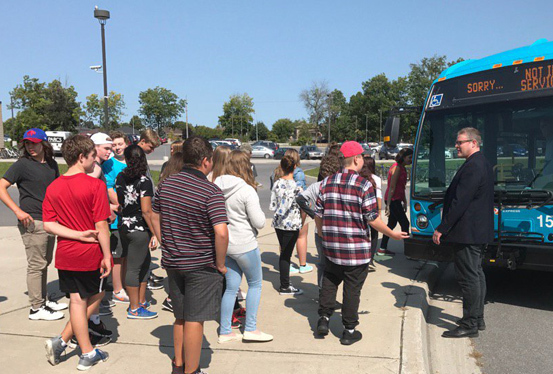 An innovative partnership between the City of Kingston and the Board allows all secondary students to experience freedom of movement while practising sustainability, responsibility and independence. All Limestone students in Grades 9 to 12 are eligible for a free Kingston Transit Pass to encourage them to ride the bus to access recreational programs, volunteer opportunities, jobs or school programs. Ensuring all students have access to free passes creates equity for all by removing accessibility barriers that might exist for some. One of the most important aspects of this unique program – said to be the only one in Canada- is the orientation students receive. The orientation which is provided to incoming Grade 9 students each new school year includes how to board and exit the bus using their pass, what they shouldn’t bring on the bus, how to raise the seats for someone who needs accessibility seating, how to use bike racks on the front of the bus, and overall bus etiquette. When the program started, there were about 28,000 student rides. Today, that number surpasses 575,000 rides annually.